Since I decided to take my BHS stages, there’s been a long gap between taking my Stage 1 and the next exam. If I’m honest, that gap has been about three years long! Part of the problem was that my next exam was the Riding and Road Safety Test, and most test centres seemed to be a long way from me, or to offer dates that I simply couldn’t do. This year, I decided that it really was time to take the plunge if I was ever going to get anywhere. Anxious not to lose the momentum, I logged onto the BHS website, found that there was an exam not too far away in only four days time, and booked myself in. 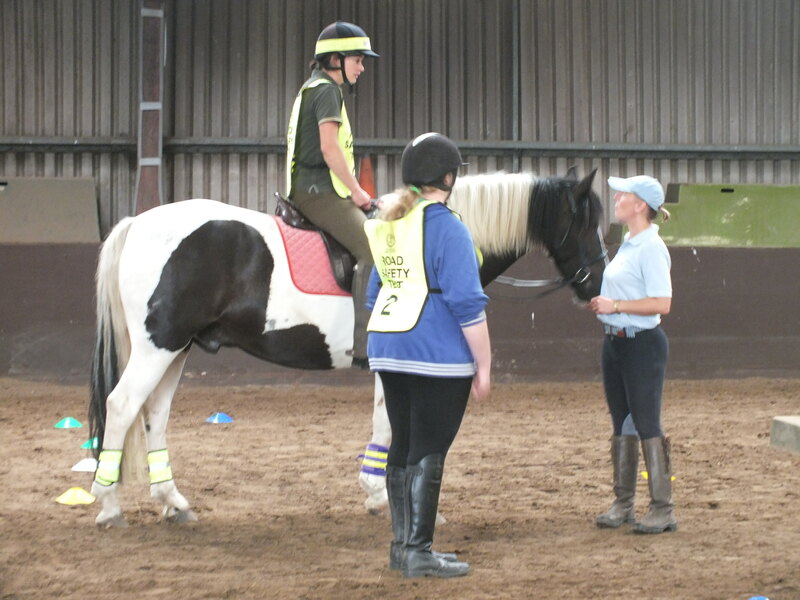 The Riding and Road Safety Test is recommended for all riders who ride on the roads, and is particularly useful for young riders and non-car drivers, as it teaches an awareness of dangerous situations. Hacking out on the roads can be unnerving these days, as modern traffic tends to be fast, varied and plentiful, and the BHS test teaches riders to take control of situations and make themselves as safe as possible. The exam is split into three parts – a theory test, a simulated road test and finally a real road test. The BHS recommend that you attend a training course – normally around six two-hour sessions – beforehand, but obviously I didn’t have time to train as I’d made such a late decision about the exam. candidates are expected to answer questions from the Highway Code, and the BHS Riding and Roadcraft manual, 12th edition, and I’d already bought and read both books. On the day of the test, things didn’t go well. I was taking Blue with me, as my late booking meant that the Centre didn’t have a spare horse, and as I had to allow at least an hour and a half to get to the test centre, Carrington Riding Centre near Manchester, with the trailer, it meant a very early start. Janice Pickup, the trainer, was there to meet us all at reception – 15 candidates instead of the usual eight or nine meant a very full exam! Riders wait their turn to ride the practice route at Barnston. Photo courtesy of Lesley Broadhurst. We started with the theory test – a multiple choice exam lasting around 20 minutes. Candidates have to get at least 75%, or 15 out of 20 questions right. Sample questions include topics like how to ride on the roads in icy conditions, what equipment to use, road signs and first aid. All the candidates (including me) passed this section with flying colours, and I found it straightforward, having read both books thoroughly. The route was marked out with plastic cups, hazards were represented by jump poles and traffic cones, and T-junctions were marked with flour for road markings. The weather was very hot and still, the horse flies were out in force and soon all the candidates were fidgeting in their formal riding clothes and fluorescent tabards. After the simulated test, it was out on the roads to ride a very short road route in real traffic conditions, to test control in traffic, signalling, negotiation of hazards and courtesy to other road users. Under-prepared, I failed the practical session for insufficient observations and not taking control of a potentially dangerous situation fast enough. It was back to the drawing board to get some training, and try again! 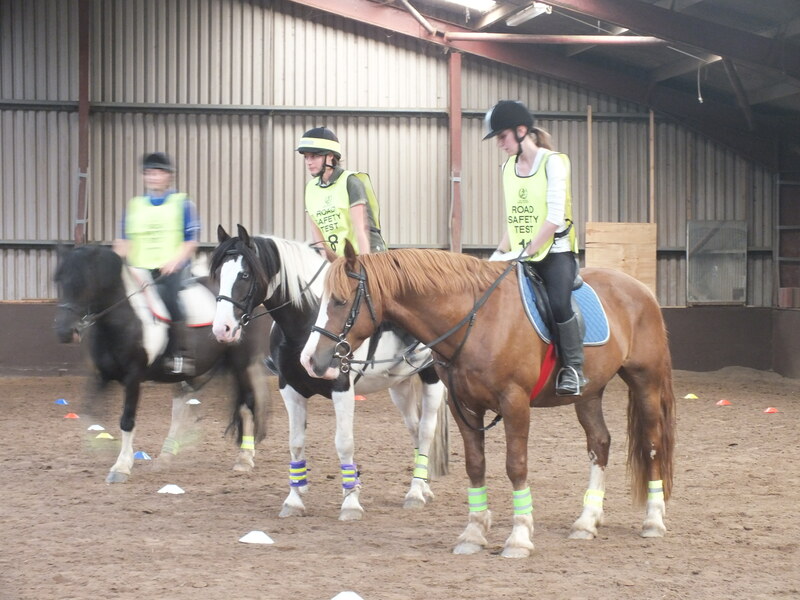 I wanted to keep the momentum going, rather than wait another three years, and was relieved to find that another centre not too far away, Barnston Riding Centre on the Wirral, was holding an exam in two weeks’ time. As I was again too late to sign up for the full training course, I booked a couple of hour-long private sessions with registered freelance trainer Janice Pickup, who’d been the trainer at Carrington. Janice came out and trained Blue and me at our own yard, and also advised me to join the final session at Barnston so that I could ride a practice course before the exam. Janice drilled me carefully on each section of the test. “Remember: Observe, Signal, Observe, Manoeuvre,” she told me. The second observation is the ‘life-saver’ look, given over the right shoulder before making any moves. I learnt to give my turning signals clearly, putting my arm out confidently at shoulder height with the palm facing forwards and the fingers closed, holding the signal for three seconds to make it visible to traffic. I learnt how to position myself at junctions so that I was clearly visible to cars, and how to check the road before crossing. Janice showed me the recommended way to pass hazards, mount and dismount, and deal with traffic lights, instructing me to observe and signal as soon as the sequence showed red/amber, so that I could move off without wasting time as soon as the lights went green. This time, things went much more smoothly on exam day. I was booked in to ride one Barnston’s horses, a lovely coloured cob called Duke. I didn’t need to take the theory test again, having passed it already, so it was straight to the simulated test, which was set out in a field. 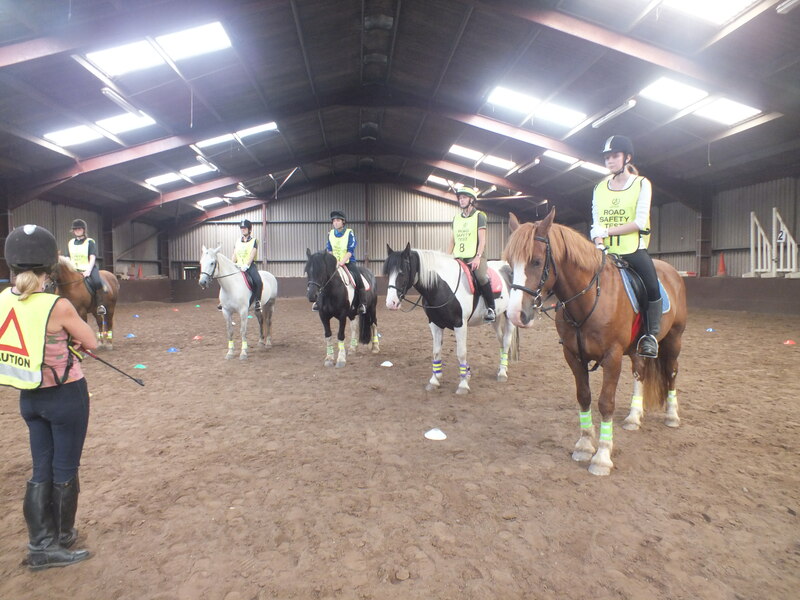 The candidates waited at one end of the field, and we each rode the test individually. Finally, it was out onto the road. One at a time, we rode down the driveway (treating it as a road), turned right at the T-junction then right again into a minor road. Having made a U-turn, we rode back to the centre, negotiating a handy parked car on the way. With Janice’s training behind me, I put in a much better performance, and examiner Alison came over to tell me what a difference she’d noticed as she passed me. Sara and Duke get some final tips from trainer Andrea during a practice session at Barnston. Photo courtesy of Lesley Broadhurst. With the Riding and Road Safety Test finally under my belt (and a cute BHS pin badge to prove it), I’m now ready to look at my Stage 2 exam – and this time, won’t be leaving it for three years! For details of test dates in your area, or to find a training course, visit the BHS website.